White tea is made from new growth buds and young leaves of the tea plant (Camellia sinensis). 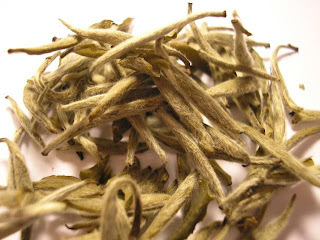 The leaves are steamed or fried to inactivate oxidation, and then dried.White tea has kind of pale...white appearance. It contains higher level of caffeine than green tea. Everyone from chefs to medical researchers is praising white tea’s delicate flavour and health benefits. White tea contrains more polyphenols, the powerful anti-oxidant that fights and kills cancer-causing cells, than any other type of tea. As to 2004 study made at PaceUniversity in the USA white tea can help human immune system fight off viruses and dangerous infection-causing bacteria. The same study also concluded that fluoride-rich white tea helps prevent the growth of dental plaque, the main cause of tooth decay.How to prepare white tea? First of all, do not use boiling water cause it can ruin white tea's flavour. The Ideal water temperature for white tea is between 75-85 degrees Celsius. More tea leaves should be used than normally... start with 2 teaspoons for every cup of water. If desired you can use more. Tea is prepared in 5 to 8 minutes but some experts recommend time of up to 15 minutes.White tea is a specialty of Chinese Fujian province (southeastern China). The most popular Chinese white teas are Bai Hao Yinzhen (Silver needle), Bai Mu Dan (WhitePeony), Gong Mei (Tribute Eyebrow) and Shou Mei (Noble, Long Life Eyebrow). On mountain peaks of Chinese Yunan province (southwestern China) White Puerh tea is harvested. Other quality white teas are Darjeeling white from Darjeeling in India, Assam Whitefrom Indian state of Assam and Ceylon White grown in Sri Lanka.